Let me first say I know I have quite a few pros here. I also have a lot of newbies and not-quite-pros-yet too. So this may not fully apply to you if you've already got things running like a well-oiled machine. In any case, I do think most of them are probably right. The problem is most folks won't actually DO anything to get the results they want. So everybody is telling us what we need to do to have a great new year. But at the end of the day, it's up to us to execute. The thing is, we all have something in us that the world needs. Sounds cheesy, I know... but I 100% believe it to be true. The trick is getting past the roadblocks that keep us stuck. Now I'm not a coach... though I have been known to motivate my peeps to action... at heart, I'm an implementor. Quite simply, I help people get stuff done. I take someone's vision or desired end result, create a plan to get there and then help them implement that plan. That's my thing. If you have no products or services to sell, you won't make money. If you don't ask people to buy from you, you won't sell a thing. If you don't have a plan and a system that you can execute, your business won't grow. Many people tell me they want to launch a course and sell it online. But they don't do it. Why? More than anything they get overwhelmed with the process. So here are my thoughts on how to beat the overwhelm so you can share your brilliance with the world. Just one. Think about what your audience needs. What is ONE of their desired end results? There are likely many that you can come up with. Do a "brain dump" and make a list. Then pick one. Why? Because specificity sells. Think about how you shop and how you search online. When you go to Google, you're looking for one thing. So is your audience. It's human nature. Write (or record) about that one problem and how to solve it. Just get what's inside of you OUT. Put it on paper. Record an audio or video. Don't worry about having a title or having it perfect. Don't worry about how you're gonna format it or how you're gonna sell it yet. Just get it out. Look at what you've produced, give it a title. Make it a title that speaks to the person you created it for. It should speak to their pain and solution. Cutesy titles are great but if they don't resonate with the potential buyer and they don't know right away that "oh yeah, this is me", then they won't buy. Keep it simple. Whether it's a PDF download, video or audio. At this point, you can worry about dishonest people getting it and giving it away or reselling it... or not. I've been doing business online for 17 years so let me just tell you... if someone wants to be dishonest and resell your stuff... they will. Personally, I don't let that stop me. Do what you gotta do to protect yourself and go about your business. There will be more who do it right than those who do it wrong. Whether that means you upload it to your own website, Amazon, use Facebook, Ebay, Etsy... the options are plenty. Again, just choose one to start. For information products (eBooks, PDFs, audios) sites like e-Junkie.com and Selz.com are good places to start. If you're selling a course, sites like Teachable.com allow you to host and sell your course through them. The point is, start somewhere. Selling online is way easier than it used to be. When I started in 1998 the cost to get a merchant account that allowed online sales was ridiculous. And the options were very few. Now, you have Paypal, Stripe and so many other providers. That's pretty self explanatory. Tell people about what you have. Ask them to buy it. If you don't make offers, no one will buy. And you don't have to be sleazy-salesy, use fake scarcity or operate in a way that is not authentic to who you are. Just be you. Offer value in advance and be real. I know that all sounds so simple. It really is. That's how you really have a great 2016... by executing. You juuusst have to start. Launch something. Put yourself out there. Be willing to invest in yourself and your business -- it's the only way you'll grow. Don't be afraid of making mistakes or afraid of some things not working. Test... keep what works, get rid of what doesn't. 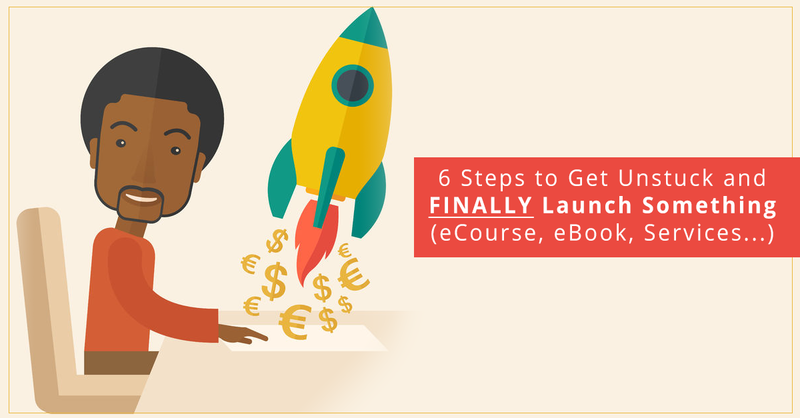 NOTE: My How to Launch Digital Products Action Guide shows you how to monetize your expertise, turn your thoughts into income and create new or additional streams of income to your business. It's great for service-based entrepreneurs who want to add passive income to their business and not only trade time for money. Check it out!